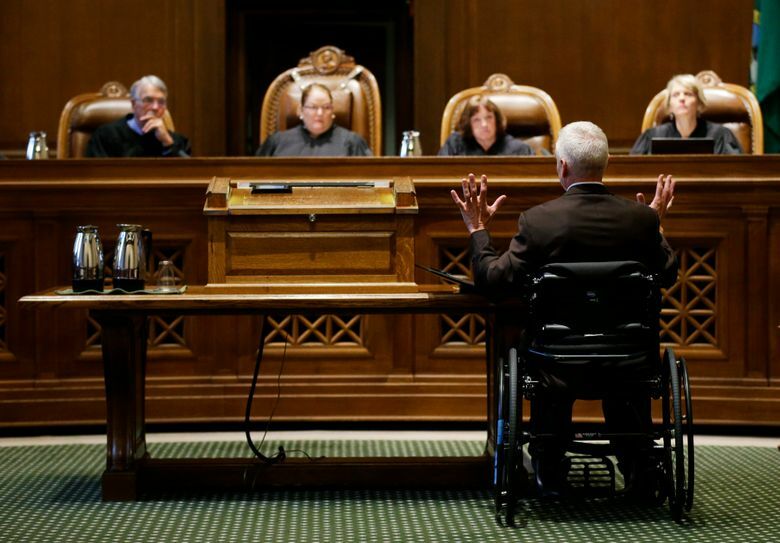 Washington’s Supreme Court justices on Tuesday weighed whether lawmakers have done enough to fulfill the court’s landmark school-funding ruling, known as the McCleary decision. 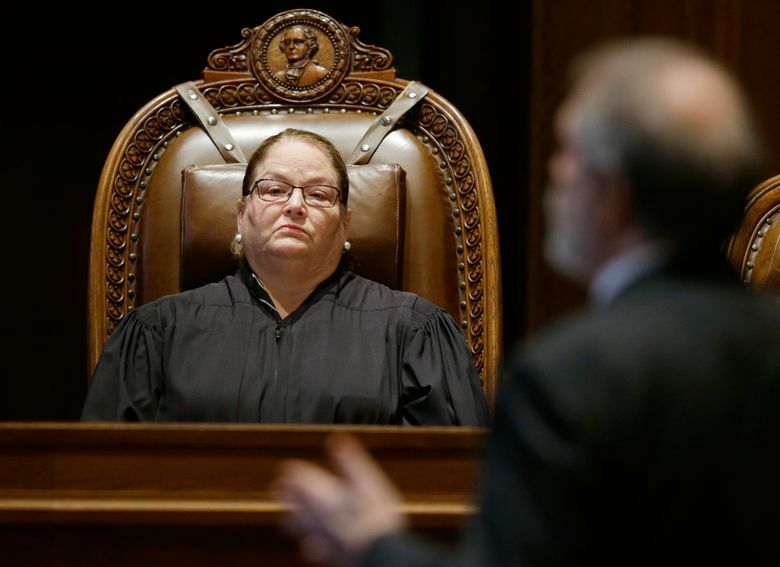 OLYMPIA — In the latest Supreme Court hearing on school funding Tuesday, the justices seemed to be weighing whether they could prod lawmakers to add more money to the education plan passed by the Legislature this year. The state operating budget and four-year school-funding plan approved in June are supposed to fully fund the state’s public schools, as required under the court’s 2012 McCleary decision. But many of the justices asked questions that challenged that notion — and those who watched the hearing said the justices appeared frustrated with both the state and the plaintiffs. In the landmark McCleary decision, the court found that Washington was unconstitutionally underfunding its schools. The state has been held in contempt since 2014 for failing to make enough progress on a plan to fix that. This year, lawmakers and Gov. Jay Inslee approved a $7.3 billion, four-year plan intended to satisfy the court. On Tuesday, an attorney for the state argued that the new funding plan finally will provide enough money to pay the entire cost of what the state constitution requires: a basic education for all Washington’s schoolchildren. The lawyer for the plaintiffs insisted the Legislature still has a long way to go before it reaches that goal — possibly billions more in funding. The justices sounded skeptical of both claims. They also inquired about a capital-construction budget with nearly $1 billion in school-construction funds that stalled this year in the Legislature. No one knows if the justices will bless the new plan with their approval. They could pat lawmakers on the back for fulfilling their duties and remove the contempt order. Or, the court could increase the sanctions against the state — beyond the $100,000 in daily contempt fines that have accrued since 2015 — for not doing enough to fund the education system. In Tuesday’s hearing, the justices asked about what the Legislature could do in the 2018 legislative session, which starts in January. With the two-year budget passed last year, lawmakers usually don’t make big changes. But Justice Sheryl McCloud pressed Alan Copsey, an attorney for the state, on what lawmakers might be able to accomplish next year in terms of additional funding. “What number is within what could be done in a supplemental budget?” McCloud asked. The justices also grilled the state about the plan’s timeline. It won’t be fully implemented by the McCleary order’s original deadline of Sept. 1, 2018. “We’re here today, and what’s been brought is something that says, ‘We’re not going to do it all, we’ll do some and we’ll do more later,’ ” said Chief Justice Mary Fairhurst. The justices also questioned a number of other aspects of the funding plan, including the cap on special-education funding, and the fact that districts with high housing costs will get more to pay their teachers. “Don’t you think it’s fair for us to ask, ‘What do you mean, all of a sudden?’ Why is this all of a sudden?” Justice Debra Stephens asked. For Stephanie McCleary, namesake of the lawsuit, Tuesday was another day in a courtroom, watching the case that started in 2007 grind on into its 11th year. With the funding plan before them, the justices now have to decipher a budget document many education experts still can’t comprehend. State schools chief Chris Reykdal said he sensed frustration by the justices over how the two sides define the education-funding problem. The state has made significant progress, Reykdal added, but there are still shortfalls in areas like special education and school construction, with the lack of a capital budget. One main goal of the court’s 2012 decision was to raise state spending on schools to the point where school districts don’t have to raise their own money to cover basic education costs. The state constitution says those basic costs are the state’s responsibility. The Legislature made progress in 2013 and 2015 toward satisfying the ruling, but waited until this year to tackle a last, looming sticking point — how to pay the salaries of teachers and other school staff. In the budget plan passed this year, the state will increase funding over the next four years for teacher salaries, to lower class sizes and to boost programs for students who are gifted, learning English, or have special needs. It includes new state revenue, including money raised through a state property-tax adjustment, while at the same time phasing in a limit to what school districts can raise locally. The property-tax plan will eventually amount to an overall tax cut in some school districts, while raising taxes in others. In an email, Sen. Ann Rivers, R-La Center, said she was unable to watch the hearing. But, she was “confident that our bipartisan solution to McCleary will prove itself once it has time to take hold.” Rivers was one of eight lawmakers who drafted the education plan. “It would be good to know before the 2018 session whether the justices agree,” she added. Rep. Paul Harris, R-Vancouver — another member of the McCleary group — said he hopes the court accepts the plan and its timeline. Before the state can send more money to the schools, it must adjust property taxes, which Harris said will take time. “It’s really difficult just to say let’s turn it up, and fund it fast,” he said. Sen. Christine Rolfes, D-Bainbridge Island, said in a statement that some work remains, including more money for special education and passage of the capital-construction budget. Inslee has long considered the McCleary order as “the low bar for education funding,” spokeswoman Jaime Smith said. She cited the governor’s more ambitious and expensive K-12 proposal last year. Lawmakers and Inslee may consider some smaller adjustments next year to the new plan, Harris and Smith said. Beth Sigall, who founded the Eastside Education Network and has three children who attend Lake Washington schools, said the justices sounded more frustrated than they had in previous McCleary hearings. “They seemed frustrated — and stymied — by the lack of viable options to resolve a 10-year-old case whose deadline has come,” Sigall said. The court’s most practical solution, she said, might be to maintain its oversight of the case to see if the Legislature fully implements its McCleary plan in its 2019 session — an option that the state’s attorney suggested in Tuesday’s hearing as a fallback position the court could take.